Ice massage is a great way to apply ice therapy to a sports injury. It has many benefits over ice bags, and is especially useful for injuries like shin splints, plantar fasciitis, and hip flexor strains. Read on to learn how to make your own ice cups. It allows for a better penetration of the cooling effects of ice therapy when compared to traditional ice bags. It also uses the effects of massage to mobilize the soft tissue. When applied to superficial muscles, it can help to decrease inflammation and to reduce pain. All you need to make your own ice cup is a bathroom size paper cup. I believe they are the 3-4oz variety. Simply fill several of these 3/4 of the way up with water and put them in your freezer. Once frozen, they will make a perfect ice cup. Once the cups are frozen, remove one from the freezer, and tear away the top 3/4 of the paper cup. 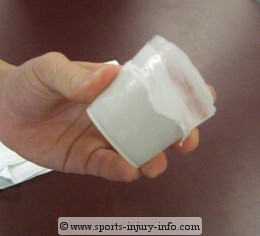 This will leave the bottom of the cup for you to hold onto, and the ice will be exposed to rub onto your sports injury. 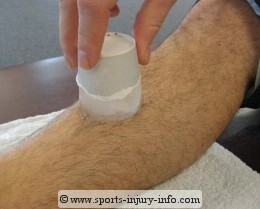 To apply the ice therapy, simply rub the ice cup over the areas of pain or discomfort. I tell my patients to apply for 8-10 minutes. Make sure you put a towel under the areas being iced, as it will melt and drip. 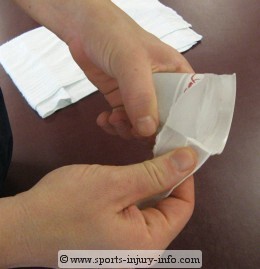 Ice cup massage is an inexpensive and easy way to apply ice therapy to your sports injury. With just a little preparation you can have ready made ice cups in your freezer.